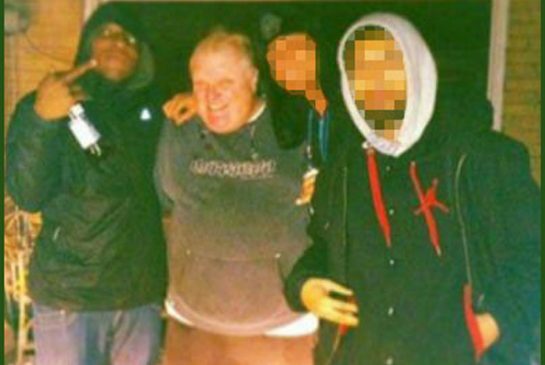 Toronto mayor/clown Rob Ford (second from left) not-hanging-out with not-drug-dealers. As you may have heard, Rob Ford, who pulls double duty as both Toronto’s official clown mascot and its mayor, is in a situation where he’s had a lot of splainin’ to do. ‘Cept he hasn’t been doing a lot of splainin’. He just did a little splainin’, and even then his splainin’ wasn’t too good. Like, for instance, he said, “I do not use crack cocaine,” which is not the same thing as saying, “I have never used crack cocaine, and I will not start using crack cocaine as soon as this press conference is over and I can find a bathroom with a locking door.” It’s not so much a denial as a set-up to a punchline. Mr. Mayor, or Happo, if you prefer to go by your clown name, how do the effects of not-smoking-crack compare to, say, the effects of not-tooting-some-fine-Bolivian-flake? Why did you allow yourself to be photographed not-smoking-crack with those not-drug-dealers? Was it because you were not-high at the time? If someone wanted to buy some really good not-crack so that they could not-smoke it, where in Toronto should they not-go? And have you ever thought of just clowning full time?